CHESTER, Pa. — Joseph Edgette didn't know much about the Titanic when he began teaching at Widener University, even though the school is named for a stunningly wealthy Philadelphia family that lost two people in the tragedy. But after a Widener descendant showed Edgette heirloom jewelry that survived the ship's demise, the professor — who holds a doctorate in folklore — felt compelled to do a little research. And then a little more. As the world this week marks the 100th anniversary of the ocean liner's sinking, Edgette is working to document the final resting places of all its passengers. He specializes in gravestones and cemeteries. "Basically, I'm getting through their lives by going backwards, by looking at their gravestones," Edgette said. "That becomes a springboard into the story behind the person." Though most of the approximately 1,500 victims were lost at sea, over 300 bodies were recovered from the icy Atlantic. More than 700 passengers survived. Edgette said he's documented several hundred gravesites, a majority along the Eastern Seaboard in New York, New Jersey, Connecticut, Massachusetts and Pennsylvania. Most do not mention the most famous maritime disaster in modern history, he said. "For a lot of these people, it was such a horrible experience they did not want to discuss it or even talk about it again," he said. Edgette became intrigued by the Titanic after meeting longtime a Widener trustee in the mid-1980s. Fitz Eugene Dixon Jr. wore emerald and ruby rings that his grandfather, George Widener, had given to his wife for safekeeping as he helped her into Lifeboat 4. George, Eleanore and their adult son Harry Widener had boarded the RMS Titanic in Cherbourg, France. George Widener had been looking for a chef for his new hotel in Philadelphia, the Ritz Carlton, Edgette said. But after the ship struck an iceberg on the frigid night of April 14, 1912, Eleanore Widener was the only family member to survive. She eventually remarried and died in 1937. Her crypt marker at the Widener mausoleum in Philadelphia makes no mention of the Titanic — a reflection of her reluctance to discuss the ordeal, Edgette said. But Harry and George Widener have cenotaphs in the mausoleum, Edgette noted, both of which reference the ship. Harry Widener also has a memorial at Harvard University, his alma mater. His mother donated money to build what is now the school's main library; the marker she placed there says Harry died at sea "upon the foundering of the steamship Titanic." Edgette, now retired, said his work furthers and corrects previous crowd-sourced research on Titanic graves and memorials worldwide. He personally inspects cemetery records and burial plots, some of which are on private estates, he said. Gravestones and funerals are the often-forgotten final chapter in people's biographies, he said. What type of marker do they have? What type of memorial service was held? Efforts like Edgette's help feed the insatiable thirst for knowledge about the catastrophe. Mary Ann Whitley, a trustee of the New Jersey-based Titanic International Society, said enthusiasts who "collect" information about the ship are "no different from people who collect stamps or coins." "I think we want to know everything it's possible to know," she wrote in an email. Edgette has yet to visit some far-flung Titanic graves in places including Britain, Ireland and South America. But he has done extensive research in Halifax, Nova Scotia, where 150 victims are buried. The Canadian city served as a staging and rescue base for the disaster, which occurred off Newfoundland. Another 59 bodies recovered from the Atlantic and taken to Halifax were shipped to family members elsewhere, according to province archives. And 128 corpses recovered by rescue vessels were returned to the sea. Among them was George Widener's 33-year-old valet, Edwin Keeping — also known as Edward — whose face had been badly disfigured in the wreckage. He was identified in part through an monogrammed locket, which was returned to his wife. Coincidentally, the locket is being offered for sale this month by RR Auction of Amherst, N.H. The gold piece with diamond accents includes water-damaged pictures of Keeping's wife and baby daughter. 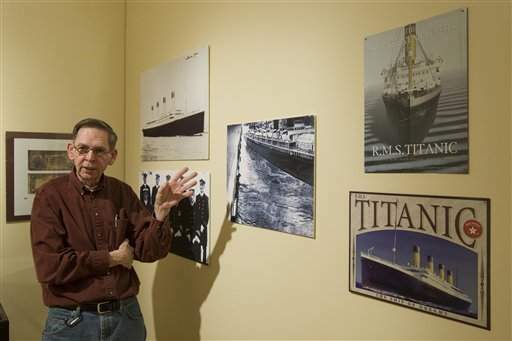 Edgette is also curating a new Titanic exhibit at Widener in Chester, Pa., just outside Philadelphia. It opens April 10 — the centennial of the day the ship set sail from Southampton, England, to New York. Of note is a display on some of the smallest victims of the tragedy: Nine of 12 dogs brought on board the ship perished. All belonged to first-class passengers; two Pomeranians and a Pekingese survived. The exhibit includes a few century-old newspapers monitoring the fate of local passengers: "No word of Wideners," reads a subheadline in the Philadelphia Record of April 17, 1912. "I don't look at this anniversary as a celebration," Edgette said. "We're commemorating the loss of the greatest ship that ever sailed."